Driven by big goals and even bigger ambition, Brian Sharp has achieved in life and business what many only talk or dream about. With nothing more than a pure motivation to succeed, Brian has certainly achieved with passion. But he’ll be the first to tell you he’s just getting started…in business and life he has much more to learn and achieve. 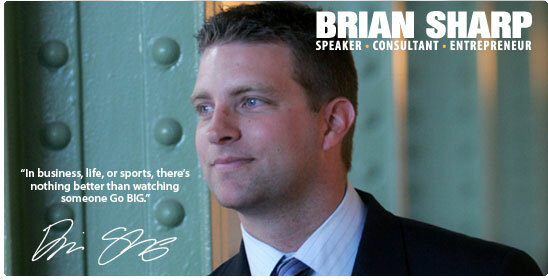 Brian’s speaking programs are powerful, passionate and personal. Whether addressing a group of college students or entrepreneurs, the message is the same: Go BIG! Brian’s story and experience is inspiring but relatable. And so too are his speaking programs. But most importantly, your audience will walk away inspired and with the tools needed to take immediate action. Whether you don’t have the time or resources, or just need a fresh perspective for your staff or students, Brian’s Go BIG programs can give you and your staff just what you need – SUCCESS!! Brian understands the challenges of managing, training, and motivating a staff. As an owner of companies in the financial services, retail, real estate, and consulting fields, Brian can offer a unique perspective that is something your staff can relate to and appreciate. Brian understands the challenges that face today’s small business owners because he is one! Still involved in the management and operation of all four of his companies, Brian faces many of the same day-to-day questions and issues that you do! And having served as a volunteer and board member for various non-profits he understands the similar challenges that non-profits face. The Go BIG program was developed specifically for small businesses and non-profits because that’s what Brian knows. And he loves working in these areas because they are filled with passionate, motivated people that love what they do!